With this opinion of his protest, it then becomes the reader’s challenge to examine the description and actions of the characters in the story and to determine who is being depicted. Although we find no overwhelming purpose for identifying most of the characters, it is interesting and perhaps informative to consider the main characters. “The belle of the county … Her form was tall …; her hair was brown, her eyes hazel, her complexion, though rather pale, was nevertheless pure and delicate; her features were what is called Grecian and chiseled. “Her mouth in particular was peculiarly beautiful; it was the feature of her face which gave it its chief expression, and there was piquancy about it which was most bewitching, at the same time a rosiness and a juiciness that was most tempting. “Indeed Mary Baun was a pretty girl – a very pretty. The tones of her voice were soft as the very soul of harmony, and cheering as the song of birds was her laugh. She sang, and played the piano too, and Jepthah’s daughter had not a lighter foot in the dance than she. “Her manner was self-possessed and pleasing; in fine, she was decidedly what is called a captivating young lady. Captivating! It is well said, when we consider the number of captives who were held in captivity, overcome by the irresistible power of her charms, by which their hearts and souls became enchained as it were, and led in triumph! Now, Mary Baun had many admirers. Need it be said that Don Laurio was among those hapless suitors, never discarded yet, never rewarded with the singular devotion of Miss Mary Baun? Next, by observing the manner in which the author describes Don Laurio, we may gain some insight into how Lawrence would characterize himself, with allowance for romantic and fanciful detail. “…He [Don Laurio] was one of those individuals who are generally called by the rest of mankind a “very eccentric character” –one of whom people are apt to say, “He is very strange, indeed!” although I dare say he was much more like other people than he had credit for, but that was not readily admitted. Perhaps the term “electric” would have been more properly applied to him than that of “eccentric”. Be that as it may, however, this young gent had the credit of being among the number of Molly Baun’s admirers, and no doubt Molly Baun ranked him among them too. “He was a youth of warm passions and fervid imagination, and of a restless and roving disposition, and was like many other of the young men of the district of country in which he was raised, who had wealthy parents to support them, without any useful occupation to engage him, and had acquired habits of idleness and dissipation. “He had been in the habit of taking long and distant journeys from home, it was not generally known where or what for, only it was not for any harm, (so some good natured folk would say,) except harm to himself. “It was after one of the longest of these rambling fits, that upon returning to his native place, he for the first time saw and fell in love with—or imagined himself in love with—Mary Baun; she like some fair flower of his own lovely valley, having sprung up during his absence, and now arrayed in all perfection was blooming to meet his raptured view. “But it was certainly thought that his many eccentricities of character proceeded from an early love disappointment. The novel includes some few lines of verse. The lines given below perhaps reveal Lawrence’s perspective of love in a mélange of sanguine reflective memories and hope of their reality impending yet beyond. In memory seem, still to live on. Too much like heaven on earth to last! Is mirrored bright in memories stream. Earth’s wreck, and live beyond the sky! 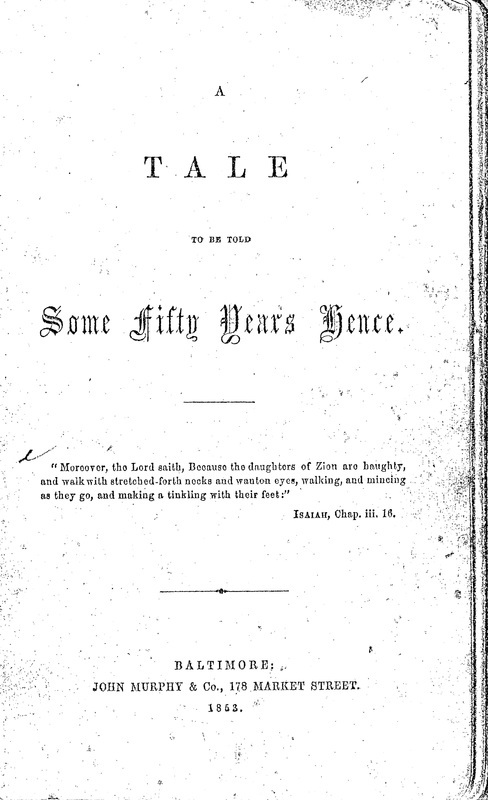 The author obviously is dedicating the book to his first cousin Daniel Bedinger Lucas (130). The book was published in 1853, when Daniel B. Lucas was at the age of seventeen; Lawrence was twenty-five years older than young Daniel. One might well wonder why Lawrence would so dedicate his book. The family relationship and proximity would have given them the opportunity to be friends. Daniel Bedinger Lucas was a precocious and academically gifted student, well versed in classical literature. He was admitted to the University of Virginia at the age of 17. His letters, written as a student at the University, are neatly penned and exhibit a young man of mature reasoning. He was a gifted poet. It is pure speculation, but we might ask; could young Daniel have contributed or assisted Lawrence in the development of the story as published by Lawrence? We have no answer to the question, thus It remains one of many enigmas surrounding the person of Lawrence Berry Washington.